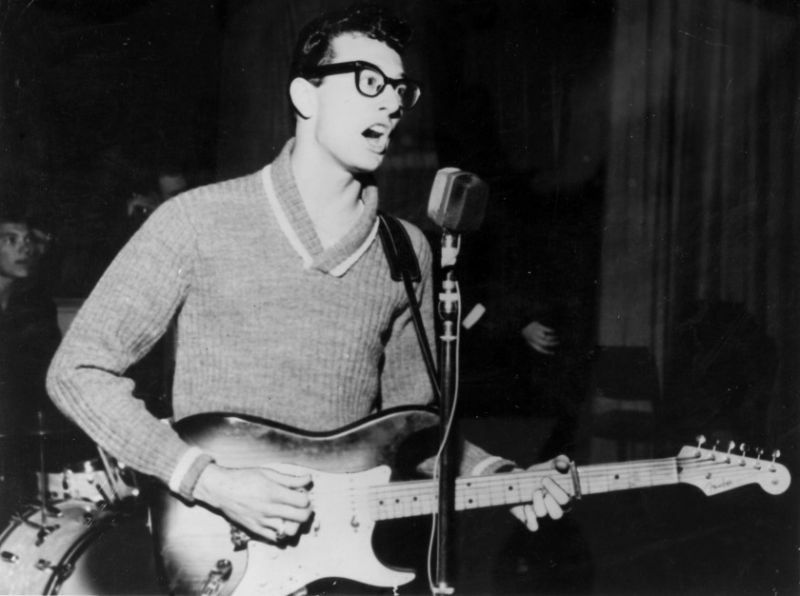 Grant Township, Cerro Gordo County, Iowa, U.S.
Charles Hardin Holley (September 7, 1936 – February 3, 1959), known professionally as Buddy Holly, was an American singer-songwriter and a pioneer of rock and roll. 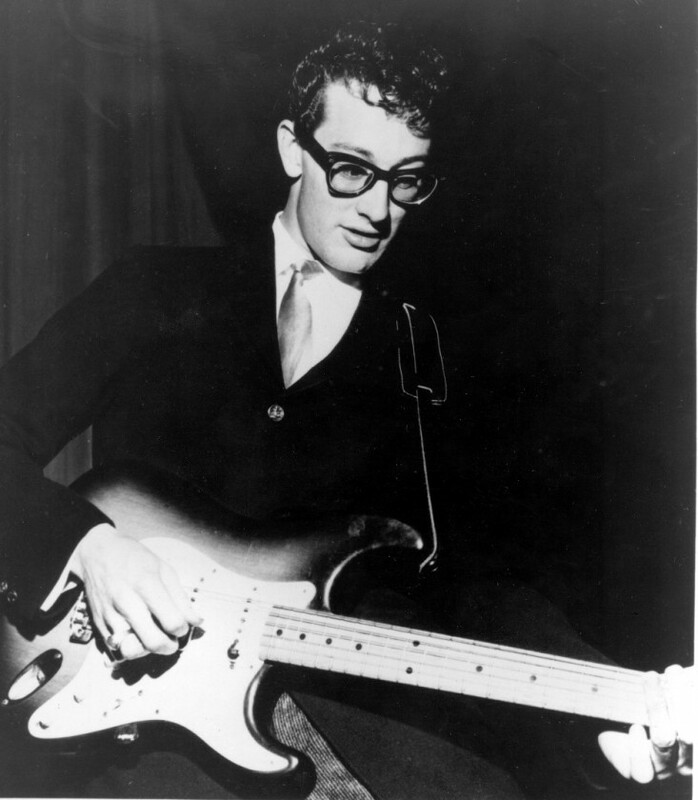 Although his success lasted only a year and a half before his death in an airplane crash, Holly is described by critic Bruce Eder as “the single most influential creative force in early rock and roll.” His works and innovations inspired and influenced contemporary and later musicians, notably The Beatles, Elvis Costello, The Rolling Stones, Don McLean, Bob Dylan, and Eric Clapton, and exerted a profound influence on popular music. Holly was among the first group of inductees to the Rock and Roll Hall of Fame in 1986. In 2004, Rolling Stone ranked Holly #13 among “The 100 Greatest Artists of All Time”. Holly saw Elvis Presley sing in Lubbock in 1955, and began to incorporate a rockabilly style, similar to the Sun Records sound, which had a strong rhythm acoustic and slap bass. On October 15, 1955, Holly, along with Bob Montgomery and Larry Welborn, opened the bill for Presley in Lubbock, catching the eye of a Nashville talent scout. 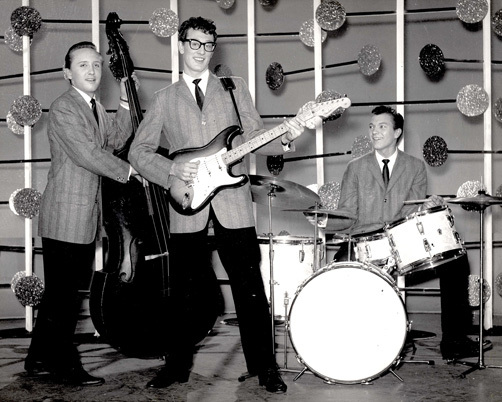 Holly’s transition to rock continued when he opened for Bill Haley & His Comets at a local show organized by Eddie Crandall, the manager for Marty Robbins. Following this performance, Decca Records signed him to a contract in February 1956, misspelling his name as “Holly”. He thereafter adopted the misspelled name for his professional career. Holly formed his own band, later to be called The Crickets, consisting of Holly (lead guitar and vocals), Niki Sullivan (guitar), Joe B. Mauldin (bass), and Jerry Allison (drums). They went to Nashville for three recording sessions with producer Owen Bradley. However, Holly chafed under a restrictive atmosphere that allowed him little input. Among the tracks he recorded was an early version of “That’ll Be The Day”, which took its title from a line that John Wayne’s character says repeatedly in the 1956 film The Searchers. 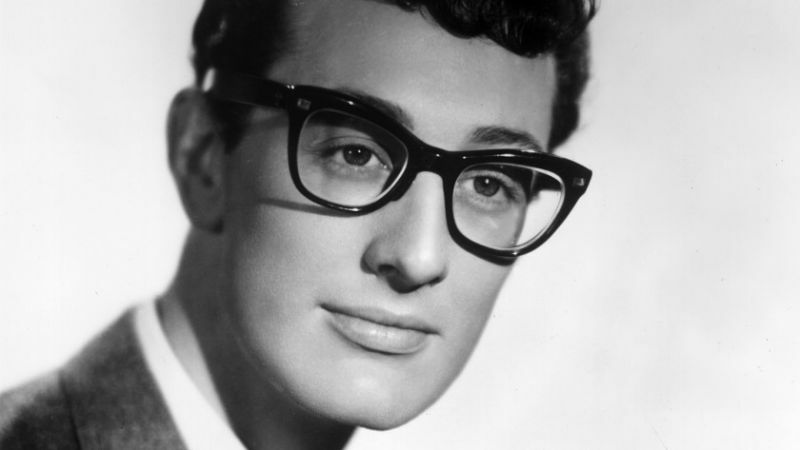 Buddy Holly is perhaps the most anomalous legend of ’50s rock & roll — he had his share of hits, and he achieved major rock & roll stardom, but his importance transcends any sales figures or even the particulars of any one song (or group of songs) that he wrote or recorded. Holly was unique, his legendary status and his impact on popular music all the more extraordinary for having been achieved in barely 18 months. Among his rivals, Bill Haley was there first and established rock & roll music; Elvis Presley objectified the sexuality implicit in the music, selling hundreds of millions of records in the process, and defined one aspect of the youth and charisma needed for stardom; and Chuck Berry defined the music’s roots in blues along with some of the finer points of its sexuality, and its youthful orientation (and, in the process, intermixed all of these elements). Holly’s influence was just as far-reaching as these others, if far more subtle and more distinctly musical in nature. In a career lasting from the spring of 1957 until the winter of 1958-1959 — less time than Elvis had at the top before the army took him (and less time, in fact, than Elvis spent in the army) — Holly became the single most influential creative force in early rock & roll. Keith Richards attended one of Holly’s performances, where he heard “Not Fade Away” for the first time. The Rolling Stones had an early hit covering the song. The Grateful Dead performed “Not Fade Away” 530 times over the course of their career, making it their seventh most-performed song. The song also appears on eight of their official live recording releases. Don McLean’s popular 1971 ballad “American Pie” is inspired by Holly and the day of the plane crash. The American Pie album is dedicated to Holly. On September 7, 1994 (Holly’s 58th birthday), Weezer released their single, “Buddy Holly”.